The A�or Mountain is an area mainly dominated by the schist, where the geological accidents give place to a vigorous relief, with round shaped mountain tops and slopes and where the water streams plough groove valleys, signed by faults such as the Fraga da Pena (a waterfall). The Protected Landscape Area of the A�or Mountain is an area with 346 hectars and is situated between 400 and 1.200 meters high. 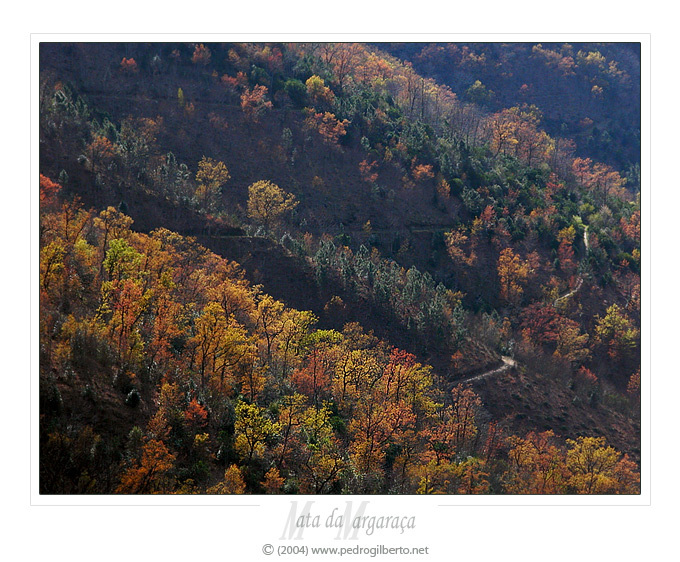 Crossed by two small water streams - the Ribeira da Mata da Margara�a and the Barroca de Degra�nhos. Mata da Margara�a, classified as a Biogenetic Reserve, is located on the north slope of the Picota Mountain and is a remarkable example of the primitive portuguese forest in the centre of the country. Besides species as the Oak, the Chestnut, the Elm Tree, the Portuguese Laurel Cherry, this wood has also innumerous vasculars species with great scientific interest and several endemic species. Among all we must mention the Solomon's seal and the Martagon lily.